Get the sleek salon look for your hair with the nova professional hair dryer and hair straightner. 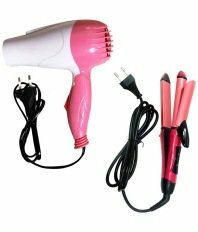 It is an 1000w cool hair dryer that can be used to quickly dry up your wet hair as well as style it up. This professional hair dryer features a styling nozzle that is designed to push the airflow from the hair dryer to areas of your hair where you want it to concentrate the air flow. The finger diff-user that comes with this hair dryer helps you to achieve the look you want, be it sleek or wavy.this hair straightener straight hair without having to put them through blow-drying, that in many instances, absorbs moisture from your hair strands. Use this straightening rod instead, and style your hair from wet to dry, and frizzy to straight, in a matter of a few minutes.